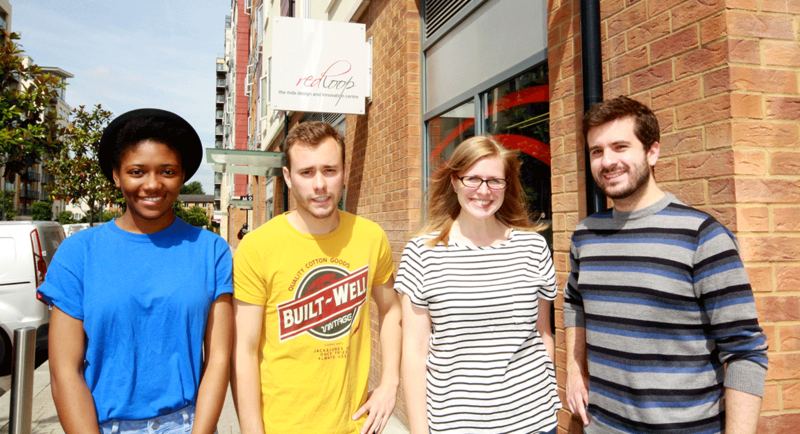 A team of interns at redLoop – the Middlesex University Design and Innovation Centre – have been awarded a £2,000 grant to develop an app they designed as part of the Jisc Summer of Student Innovation competition. The innovative mobile app called 'commUNItime' was designed by Kirsty Tither, Posola Karunwi, Alejandro Pitarch and Josep Estela, and aims to help university students volunteer and connect with their local community while also building up their employability skills. "Every year lots of students move to a new town where there is a university, but they don't always integrate as fully as they could," explained team leader Kirsty. "Students who have spare time often fall into the trap of procrastinating, so we created an app to help make better use of their free time, connect with local people, businesses and the environment while improving their CV." The competition set teams a brief to design a technology which would enhance the student experience, with grants awarded to help the winners improve their creative design, research, entrepreneurial and project management skills. Part of their prize is also a four-day 'design sprint' at the start of August designed to help them with the next stage of the process. "We are thrilled to have been awarded the grant. I'm excited about the next stage and we hope to be able to fully create the app to change the university experience for both students and the local community," added Kirsty. "An internship at redLoop is all about developing key employability skills in the creative design and technology sectors: team work, creativity on demand and a focus on user-centred solutions," said Andy Bardill, Director of redLoop. "This is another great example of our interns excelling in these skills."